OK, so you’ve set up the business and things are going well. You’ve got to grips with HMRC rules, salary payments, dividends and all the responsibilities that being a director of your own company brings. It’s easy to get engrossed in building the business by chasing contracts or leads, looking after existing customers and keeping on top of cash flow, but have you looked at ways to work smarter and make money by saving money? We’ve all done it, as contractors and freelancers we are so busy doing business we forget to take a step back and check that we’re still getting the support we need and the service we expect from our suppliers. It’s easy to live with what we’ve got, rather than take a look to see if the grass is greener on the other side – like keeping your accountant for example. When was the last time you really thought about if you’re getting value for money and if they are making your life easier? Is your accountant providing the flexibility you need, or do you need to fit in with their timetable and processes? You may pay yourself the same amount every month, but as a contractor you might need to flex your salary in line with business levels. Does your accountant provide you with the flexibility to set how much and when you pay yourself? With the introduction of HMRC’s RTI requirements in April 2013, many accountants have become even less flexible in their approach to managing their clients’ payroll. What’s more, you spend hours entering information into spreadsheets, printing and completing forms, checking information and it all seems a bit disjointed. inniAccounts was born when the founders (experienced contractors themselves) wanted a better accounting service for their own companies. We want to ensure that our online app is built around your needs, offering unrivalled flexibility so you can run every element of your business in one place, the way you want it. Running payroll, previewing changes to salary in real time to maximise tax efficiency, payslips at the touch of a button – it’s all covered. No spreadsheets, just great functionality, tailored reports, up to the minute information on how your company’s doing and qualified accountants and a support team you can call whenever you need advice. Do you have to wait until year or quarter end to see how you’re doing? You’re busy filling in spreadsheets and collating all of your invoices and credit notes, but you don’t ever seem to get an accurate picture of your finances until year or quarter end – and even then it’s historical data. Do you ‘keep 20% back’ for tax liabilities hoping this is enough? Wouldn’t it be better to understand your tax liabilities, your working capital and upcoming commitments in real time so that you can plan investment or just manage your cash flow better? We think that you should be able to see how your company is doing whenever you need to. That’s why we developed our market-leading LiveCash facility. It shows you how much cash you have available in real time. Your tax liabilities, and any other pending payments are calculated each and every time you use the app so you can see exactly how much cash you have to draw as dividends or spend on investing in your company. You pay by the hour and all those added extras! Are you afraid to ask for advice for fear of running up a large bill? You budgeted for the year-end account preparation, plus the payroll administration, but how many additional charges did you rack up over the year? Can you call your accountant for advice, or request additional reports for planning throughout the year without getting hit with another bill? We think simple, straightforward pricing makes a big difference. No hourly rates to try and budget for, just one monthly fee for managing your company accounts. 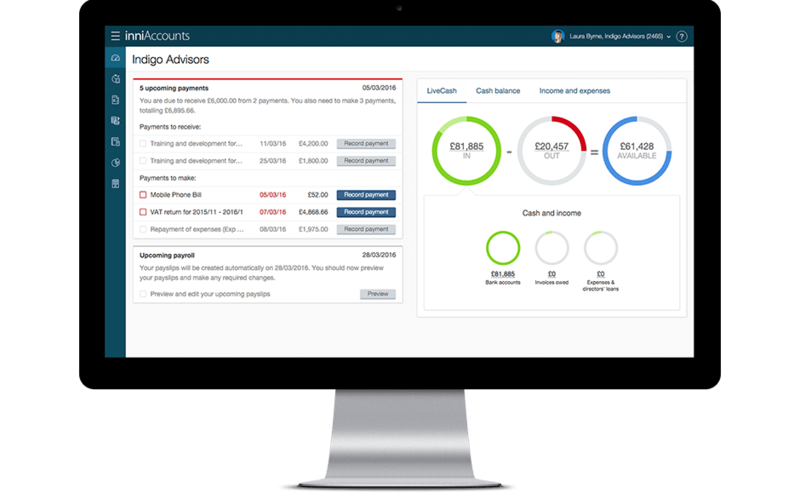 The online app that helps you run every financial aspect of your business, all the year-end accounting support that you’d expect from a traditional accountancy service, plus a qualified accountant and service team at the end of a phone (even that’s a freephone number) whenever you have queries are included. Budget smarter, know where you are, and avoid unexpected fees because it’s all covered! Is your accountant applying best practice and are your records error-free? It may sound odd, but if your accountant makes a mistake you’re liable. If you’re relying on spreadsheets, forms and then relying on someone else to re-key information and send it to HMRC, how confident are you that it’s all error free and on time? Is the process best-practice? Have you spotted any mistakes or had queries from HMRC? With inniAccounts it’s all taken care of automatically. You access your online app to enter all the relevant information (with step by step guidance when you need it); the IT wizardry does the rest. We’ve worked hard to ensure that you only need to enter important information once, and then it’s all taken care of so no re-keying that leads to errors. RTI submissions are sent to HMRC automatically, and you get reminders in good time for all the important tasks. You can set up payments to cover corporation tax and any other important payments to HMRC. You spend less time doing paperwork and more time building your business knowing that everything’s just right. Plus you can call your qualified accountant at any time if you need to check anything. Does your accountant truly understand the specific needs of contractors & freelancers? You’re a contractor or freelancer and you need specialist support from people that understand what it’s like to run a business like yours. Does your accountant offer help and advice when you need it (without charging you by the hour)? Do they send you useful guides and updates on new legislation, financial planning, and other topics that help you run your business better? Understanding the implications of new legislation and guidance from HMRC can take time. We work closely with HMRC and other influential bodies to ensure that we know about pending changes before they happen. That way, we understand the implications and can support you when the time comes to make changes to the way we do business. We provide help guides, fact sheets, core dates and a friendly expert over the phone so the impact of any changes is minimised. You can rest easy knowing you’ll be one of the first to know and that you’ve got all the support you need to comply with new rules, or simply work smarter. Some accountants might advise you to wait until year-end, usually so all the financial information is all neatly packaged for them and it makes their lives easier. In reality you can switch accountants any time. The longer you leave it, the more money and time you could be wasting. The inniAccounts team takes time to find out about your business and we help you decide when the best time to make the move is for you. That way, you’re in the best position for a seamless transition to inniAccounts. Most of our customers are moved over within a week or two of their initial enquiry, but with us, you set the pace. A lot of the switchover should happen behind the scenes. A small investment in time and effort now will reap rewards for the months and years to come. We make it as easy as possible to get set up with inniAccounts. You just fill in a simple form, so we have all the core information to get you set up within days. It’s quick to complete, and we walk you through the process. Then we do the rest, we liaise with your old accountant, HMRC and Companies House. Your team gets you set up on the online app and you can be up and running in no time. There are a lot of traditional accountants out there, and yes, a lot do provide much the same level of service; if a traditional accountant’s what you’re looking for. Ten years ago, that would be your lot, but now there’s a new breed of accountancy firm. Why settle for one size fits all, or spreadsheets and paperwork, for hourly rates and hands-off servicing? Don’t just settle; move to an accountant that looks after your needs. Ditch the spreadsheets and printed reports. Say goodbye to being billed by the hour. With inniAccounts, you’ll have an easy to use online app that takes care of all your financial admin; payroll, payslip generation, expense administration, project tracking, invoicing clients, tax and NIC calculations, reporting at the touch of a button, and LiveCash that shows you your available cash in real-time. You also have team of qualified accountants and an account manager to help with anything else, plus ensure all the year-end accounting is completed in double-quick time. Why settle for anything less? It’s not just the savings that can be made in fees, think about the time you spend on number crunching, sorting out invoices, tracking time spent on projects, billing clients, tracking payments, paying yourself and staff, sorting out the paperwork to submit to your accountant. It all adds up and every hour you spend doing it, is an hour lost from making money or enjoying your downtime. Take care of your finances and admin in minutes rather than hours. There’s so much functionality packed into our online app, you’ll spend less time entering information and more time on what you do best – running your business. Payslips, invoices and reports at the touch of a button, and auto reminders so you never miss a deadline add peace of mind. You can manage salary and expenses to pay both via your payroll. Our app calculates everything for you including tax liabilities immediately and you get a payslip at the push of a button. Loyalty pays and my accountant knows my business. How well does your accountant know you, and more importantly, know your business? Have you really seen any benefits from staying loyal to your accountant? Have you seen any rate increases – yearly or after the introduction of RTI if they administer your payroll? Wouldn’t it be great to work with someone that really knows what it’s like to be a contractor? inniAccounts was founded by contractors that wanted a better way to run their companies. IT wizards, marketing and business development gurus are all part of our team. inniAccounts has the power of an amazing team of qualified accountants and contractors at its heart so we understand the pressures you face. We’re a close team and like to share ideas and work on development projects as a group so all the best ideas are pulled together to make our service even better. We can help you work smarter and do more with the time you have. Let us take care of your accounting so you can take care of business. Take the first step in moving to an accountant that’s right for you. Grab a cuppa and try the app for yourself with our demo; see how easy it is to track income and expenses, run reports and print payslips. Then give us a call on 0800 033 7827 to discuss how we can help you.